A man by the name of Jeff has been intruding on classes at QU to advertise tickets for the New York Comedy Club. After saying he is a part of an on-campus club called “Quinnipiac Activities,” Jeff gives a very detailed, but questionable, sales pitch on the tickets he’s selling. Through the alleged deal, Quinnipiac students get a 90 percent discount and can therefore purchase what were initially $50 tickets for $10. It is admit two, meaning each ticket is bought for the price of $10, and two free drinks are included. Additionally, your acquired tickets can be saved for any showtime or date of your choosing. Jeff closes his speech by saying how students who have purchased tickets in the past have seen very popular comedians, such as Aziz Ansari, Kevin Hart, and Chris Rock, perform at the club. Our question is…who is Jeff? After doing some research, I found almost everything “Jeff” said to be a lie. First of all, the campus club he refers to is non-existent. Even if a QU club was selling tickets for an event, members would do so at the Carl Hansen Student Center tables. 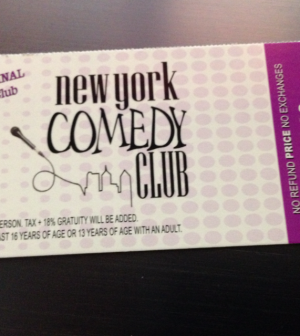 After doing some digging on the New York Comedy Club’s website, I found that the most expensive ticket costs about $30 and there is a two drink minimum. Most importantly, Aziz Ansari, Kevin Hart and Chris Rock have never done stand-up comedy at this club. Now that is not funny.